A U.S.-brokered agreement with Japan, first reported in ClimateWire, has been making the rounds at the Organisation for Economic Co-operation and Development (OECD) as member countries prepare for discussions next week on whether to restrict financing for coal through export credit agencies (ClimateWire, Oct. 27). But new counteroffers from coal-heavy South Korea and Australia that put only the loosest curbs on certain types of coal-fired power plants have thrown a wrench into the negotiations -- and, by extension, U.S. hopes of sending a message ahead of landmark U.N. climate talks in Paris that the rich world is committed to a low-carbon future. "Australia blocking international moves to reduce financing for new dirty coal plants flies in the face of our appointment as the co-chair of the Green Climate Fund and risks Australia continuing [former Prime Minister Tony] Abbott's approach of playing a blocking role in international climate negotiations," Australian Sen. Larissa Waters, deputy leader of the Australian Greens, said in a Senate speech today. 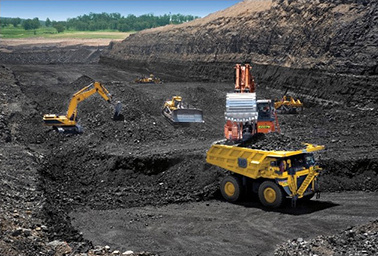 One of Peabody Energy's surface mining operations in Australia that serve both domestic and overseas customers. Photo courtesy of Peabody Energy. "The Turnbull government is trying to block moves by the U.S. and Japan to reach a deal to restrict these disastrous fossil fuel subsidies, which are currently holding back the global transition to clean energy," she said. The country's current prime minister, Malcolm Turnbull, took office in September. According to a recent study by a consortium of environmental groups, more than $73 billion in taxpayer dollars from the world's wealthiest nations went to financing coal power generating plants between 2007 and 2014. Of that, nearly half came through export credit agencies. The United States, the United Kingdom, France and a number of Nordic nations have in recent years imposed strict limits on coal financing through those types of agencies. But other major coal exporters like Japan, Australia and South Korea have resisted, citing competition, primarily from China. That started to change in September, activists said, when China agreed in a deal with the United States to rein in its overseas coal development. The United States then used that leverage to craft an agreement with Japan. Will U.S.-Japan proposal set the standard? According to the U.S.-Japan proposal submitted to the OECD, export credit support for new coal plants would only be provided if an evaluation of less carbon-intensive alternatives finds none are viable. Beyond that, it would make all but the smallest "subcritical" efficiency plants ineligible for financing, and then only in the world's poorest countries. Slightly more efficient supercritical plants larger than 500 megawatts would be ineligible, while financing for smaller ones would be eligible only over 10 years and in the poorest countries. Ultra-supercritical efficiency plants of all sizes could be eligible for financing under the U.S.-Japan proposal for a period of 12 years. The entire plan would be ratcheted up by 2021 based on the latest science and advancement in technologies, "in order to contribute to our common goal of addressing climate change," the proposal says. If put into effect by all the OECD countries, the U.S.-Japan deal could block funding for about 80 percent of coal projects currently in those nations' export credit agency pipelines, a U.S. analysis found. Meanwhile, the Australian proposal carries similar restrictions for the dirtiest subcritical technology. It would allow decadelong financing, however, for supercritical plants to both the poorest countries and "high middle income" nations. South Korea, citing "the energy welfare of developing countries," would impose almost no restrictions on supercritical plants at all. The distinction is key, said Jake Schmidt, director of the international program at the Natural Resources Defense Council, because the vast majority of planned export credit projects are supercritical. So, he said, "where the supercritical threshold lands makes a big difference." Schmidt noted that the momentum that the U.S.-Japan deal injected into the coal debate dampened when Australia and South Korea failed to come on board and then released counter-plans. He said if a deal can't be struck before leaders meet in Paris at the end of this month for U.N. climate negotiations, the road for reducing coal financing could become much rockier. "If we miss this important window, then yes, in theory, you could maybe get a better deal in the future, but next year is very different than this one. You lose a lot of momentum, and more projects go forward," he said. Michael Westphal, a senior associate at the World Resources Institute (WRI), said that if countries could send a political message on coal now, "it would really set the table for Paris." The lead author of a new study looking at the social impact of coal plants that were originated with export credit agency dollars, Westphal said WRI found just 20 such plants caused as much as $32 billion in annual health damages. The study found that South Korea is behind about $6.4 billion of those damages alone, mostly due to its association with a massive new coal project in India. "Most local air pollution costs are borne by recipient countries," Westphal said. "It's not the OECD countries that are bearing these costs; it's the recipient countries." Jieon Lee, climate and energy coordinator with the Korea Federation for Environmental Movements, said in an email to ClimateWire that South Korea's embrace of coal is inconsistent with its hosting of the multibillion-dollar Green Climate Fund, aimed at supporting low-carbon development. He called it an "irony" that the Export-Import Bank of Korea applied to be an implementing arm of that fund. "The Korean government [justifies] its position by emphasizing the importance of the 'energy welfare' for the developing countries but what it really concerns is the profits of coal industry," Lee said. Erwin Jackson, CEO of the Climate Institute in Australia, called the Australian government's position "perplexing and slightly surprising," since Turnbull's new administration has a reputation for being more climate-friendly than his skeptic predecessor, Abbott. "The only thing I can put this down to is, they were caught by surprise by the U.S.-Japan proposals and have not had a good hard look at the impacts of being seen as a negative force on the global stage," he said, adding, "It's a knee-jerk reaction based on past ideology." Officials with the Australian and South Korean governments did not respond to emailed requests by ClimateWire for comment. A spokesperson with the World Coal Association, which has been active in lobbying on the OECD debate, also declined to comment on the proposals. A White House official did not respond by press time. Activists said all eyes now are on the European Union, which has a proposal of its own to curb coal financing that some of its members feel is stronger than the U.S.-Japan measure. But Schmidt argued that strategically, all countries that support a tougher measure should choose a single plan. "The big question at this moment is whether Europeans will decide whether to throw their weight behind the U.S.-Japan proposal. If they do, it makes it a lot more uncomfortable for Australia and South Korea," he said. "If the E.U. is on board, I think it makes it hard for South Korea and Australia to block this."